OlviPet is the new brand for natural and welfare oriented nutritional supplement. All OlviPet products are made from 100 % purely natural ingredients and rich on natural Omega 3 and Omega 5 fatty acids. The immune-boosting formula supports the heart, blood circulation, the metabolism, the skin and the change of coat. OlivPet uses only carefully examined high quality raw materials. Refined by hand and enriched with a finely balanced recipe of seeds and herbs OlivPet does offer a high-quality nutritional food supplement without flavor enhancers and without artificial dyestuffs and any other additives. 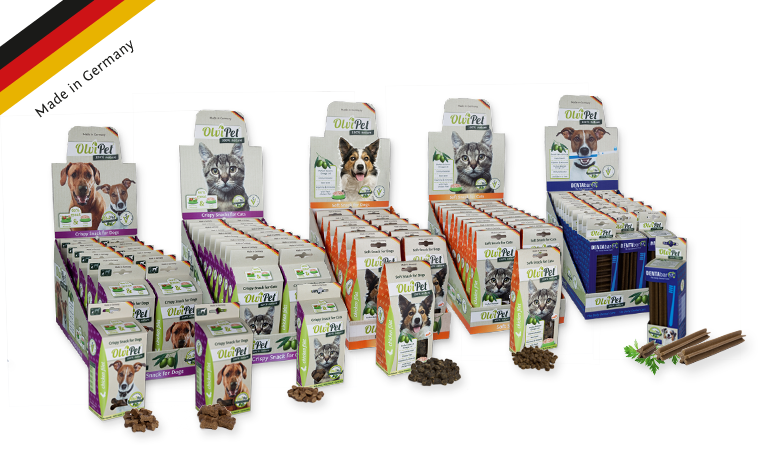 Olvi-Pet vital products are gluten-free and sugar-free, convenient through their taste and also suitable for feed-sensitive and allergic animals. We deliver what others promise!